Dressing for a Royal Occasion is always tricky and Royal Ascot is no exception. Royal Ascot is famed for the uber fashionable gracing it’s Royal Enclosure and Grandstand. But of course one must remember that they must dress appropriately for Her Majesty! We’ve noticed that with Royal Ascot fast approaching (14th – 18th June) many visitors to our website are anxious about what to wear in their hospitality area. Royal Ascot is unlike any other race meeting in that you’ll find a collection of the very best British designers work, especially on Ladies Day at Royal Ascot. It’s worth pointing out early on that whilst the dress code for the Royal Enclosure is at the high end of the formality scale, male guests with Grandstand admission aren’t required to wear morning suits whilst ladies are required to dress in a manner appropriate for a smart occasion (more on this to come). Sports attire, jeans and shorts are strictly forbidden however, apologies to the Nike and Adidas aficionados! Below you’ll find some fashion Dos and Don’ts for Royal Ascot as well as a couple of non-fashion related tips to avoid upsetting those around you. 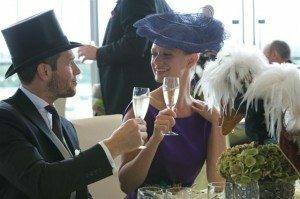 Remember it’s still a social occasion so as long as you don’t get carried away and follow these tips you’ll be well on your way to enjoying a fabulous day out at Royal Ascot! – Try a DIY hat! If you want a bespoke hat always visit a milliner. – You must wear a hat or “substantial fascinator“. – Let your hat do the drama and avoid plunging necklines. It’s easy to say but quirky hats are great fun and for injecting personality. Just don’t go too big that your neck can’t handle it! – Wear a fascinator that covers your face, you’ll miss the racing! – Although not required, many women still chose to wear hats in the Grandstand. – You can go for bright colours. Follow the Queen’s example though and always try and colour co-ordinate your outfits. – However remember that although many try to be different, classic dress shapes and colours are always a safe bet. If wearing black inject some colour into it with purple detail for instance. Where on Earth could you find a Secret Garden, Iceberg Bar and the chef of the World’s best restaurant?